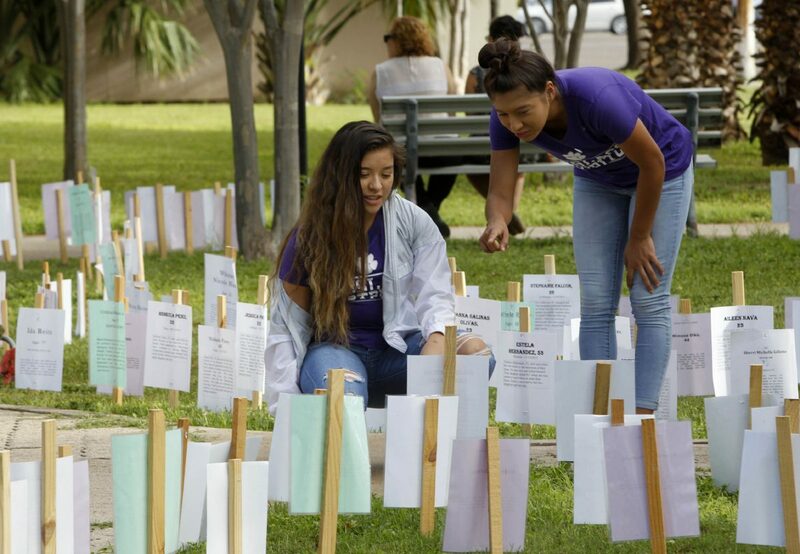 Jada Lopez, left, and Helen Gonzalez, both 16, look over memorials for victims of domestic violence during Purple Day for Domestic Violence Awareness Month Tuesday October 3, 2017 at the Hidalgo County Courthouse in Edinburg. EDINBURG — Dozens of Hidalgo County officials, advocates and community members huddled Tuesday in a sea of purple to stand together against domestic violence. More than 30 people donned purple shirts in honor of the third annual Purple Day, an event hosted by the Hidalgo County Criminal District Attorney’s office and the Hidalgo County Family Violence Task Force that aims to raise awareness and connect the community with resources during Domestic Violence Awareness Month. The ceremony outside the Hidalgo County Courthouse comes two days after a Peñitas woman was allegedly bludgeoned to death by her common-law husband. Every year, 1.3 million women suffer violence at the hands of their intimate partners. That equals to about 3,869 women per day or the equivalent of three women suffering a form of family violence every minute, according to the National Crime Victims Coalition. 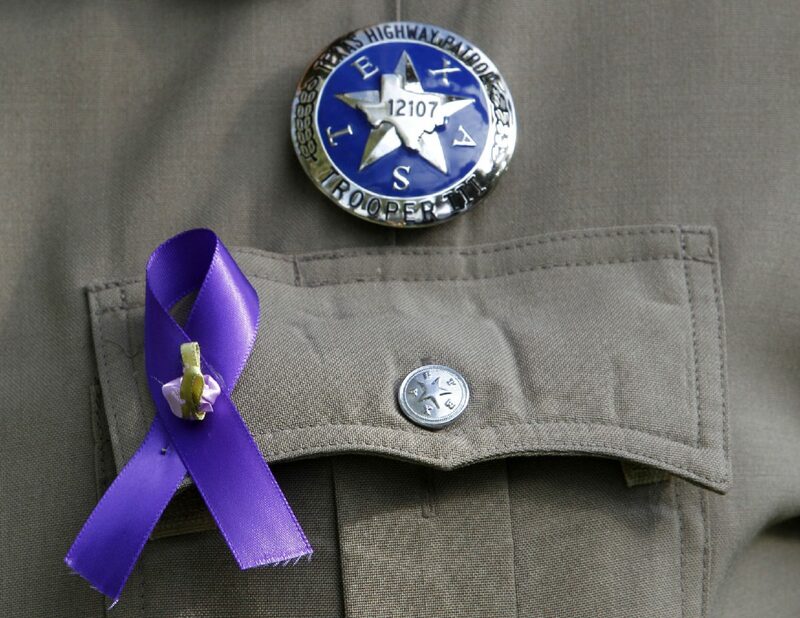 A Texas Department of Public Safety trooper wears a ribbon for Purple Day, meant to honor Domestic Violence Awareness Month, Tuesday Oct. 3, 2017 at the Hidalgo County Courthouse in Edinburg. Hidalgo County Criminal District Attorney Ricardo Rodriguez said the event recognizes those who work to bring awareness to the issue. In 2015, the Hidalgo County Sheriff’s office responded to 1,852 calls for family violence and about 5,505 cases were reported to other local law enforcement agencies in Hidalgo County. Estella De Anda, executive director for Mujeres Unidas/Women Together, said she’s seen progress when compared to her first years with the organization. “I have a dream that one of these days, they would no longer need our agency; nobody deserves to be oppressed and abused in our own home where they should be the safest,” De Anda added. More than one in three Texas women are victims of domestic violence, and more than 100 women lose their lives in domestic violence murders each year, according to the Texas Council on Family Violence. Aaron Setliff, public policy director of the Texas Council on Family Violence, was invited to attend the event and spoke about prevention. As part of the initiative, Hidalgo County commissioners presented a proclamation to the district attorney’s office and Purple Day participants, declaring October 2017 as Domestic Violence Awareness Month.